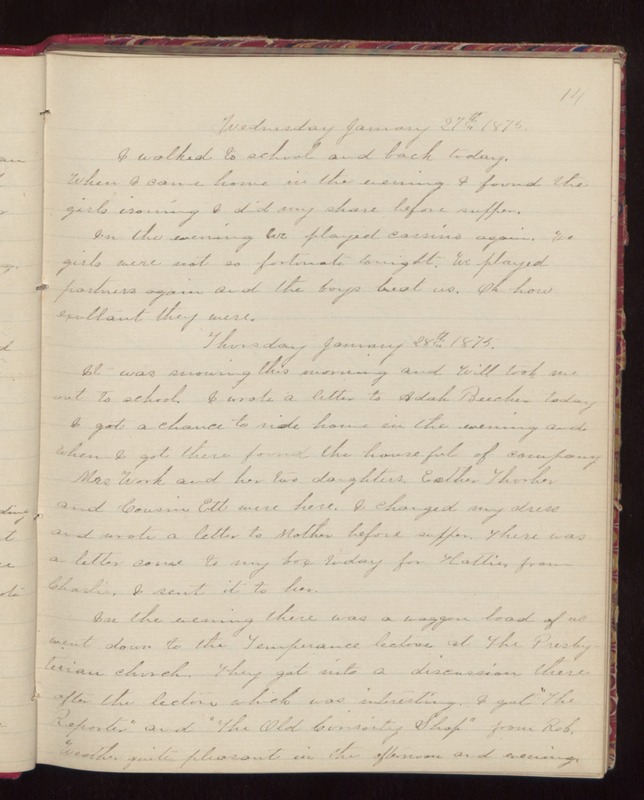 Wednesday January 27th 1875 I walked to school and back today. When I came home in the evening I found the girls ironing I did my share before supper. In the evening we played cassino again. We girls were not so fortunate tonight. We played partners again and the boys beat us. Oh how exultant they were. Thursday January 28th 1875 It was snowing this morning and Will took me out to school. I wrote a letter to Adah Beecher today I got a chance to ride home in the evening and when I got there found the house ful of company Mrs. Work and her two daughters. Esther Thurber and Cousin Ett were here. I changed my dress and wrote a letter to Mother before supper. There was a letter come to my box today for Hattie from Charlie. I sent it to her. In the evening there was a waggon load of us went down to the Temperance lecture at the Presbyterian church. They got into a discussion there after the lecture which was interesting. I got "The Reporter" and "The Old Curiosity Shop" from Rob. Weather quite pleasant in the afternoon and evening.